Second Crusade (1145-1149) - The Second Crusade began a half century to the year after Pope Urban II delivered his speech at the Council of Clermont. It was precipitated by the fall of Edessa in 1144. Edessa was the Armenian city that Baldwin of Boulogne took control of during the First Crusade. It was captured by a Turk named Zengi who himself had some interesting ties to that Crusade. His father was beheaded in 1094 for treason by Malik Shah I, the son of Alp Arslan who defeated the Byzantines at the Battle of Manzikert. Zengi was just a boy, so he was taken and raised by Kerbogha of Mosul, the man who tried to dislodge the Crusaders from Antioch in 1098. With the fall of Edessa, Pope Eugenius III called for a new Crusade to be launched. Once again, the call was answered. But unlike the first one, the Second Crusade was actually led by heads of state, namely King Louis VII of France and King Conrad III of Germany (Louis was married to Eleanor of Aquitaine at this time, and Conrad was the uncle of Frederick I, both on this chart - see above). Much like the First Crusade, the Pope relied on a monk to preach the virtues of a war in the Holy Land. This time it was Bernard of Clairvaux. Unfortunately, the emotions whipped up among the masses led to more persecutions of Jews (although Bernard himself was not anti-semitic, he tried to quell the persecutions. His subordinate, Radulph, was a primary instigator of the attacks). The involvement of two monarchs resulted in two separate armies being raised, one primarily French and the other primarily German. The German army arrived in Constantinople first in October 1147, having crossed over land through Hungary. It was generally well-behaved, but once in Byzantine territory, did engage in some looting. Emperor Manuel I had not asked for help from Europe, and was not prepared to accommodate such a large force (about 20,000 soldiers). As a result, he ferried them across the Bosporus into Asia Minor as quickly as possible. The second army arrived about a month later and Manuel tried to do the same with it; however, the French managed to loiter in Constantinople a bit longer than the Germans. Despite all the preparations, the Second Crusade was a dismal failure for the Europeans. 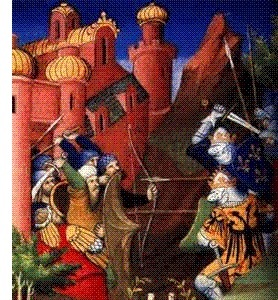 The German army was utterly defeated in almost the same location as the Battle of Dorylaeum of the First Crusade; and thus it is known as the Second Battle of Dorylaeum, fought on October 25, 1147. The Turks, led by Mesud I, almost completely wiped out Conrad's army. Only 2000 soldiers survived, including Conrad himself. But from that point, he had lost all support of his remaining troops. They managed to survive in Asia Minor long enough to join the French when they arrived. The French army consisted of about 15,000 soldiers. They and the remainder of the Germans decided to go to Jerusalem and reorganize. The original plan was to recapture Edessa from the Turks; but Jerusalem was ruled by Baldwin III, the head of the famous Knights Templar (the two most famous order of knights of the Middle Ages, the Templars and Hospitallers made their appearance in the Second Crusade). He had his sights set on Damascus, so that became their target. The Siege of Damascus lasted from July 24th to the 29th in 1148 and ended in total defeat for the Crusaders. They didn't even come close to taking the city, and their defeat effectively ended the Second Crusade. The only place where the Europeans had some success was in Spain, where the Reconquista was taking place. The Iberian peninsula, as well as the Middle East, was considered part of the Crusades. The city of Lisbon which had been controlled by the Moors fell to the Kingdom of Portugal in October 1147. The city would become the kingdom's capital in 1255, and eventually led to the formation of the modern state of Portugal. But the situation in the Middle East set the stage for the Third Crusade which, along with the first, would become the most famous in the long history of the Crusades.